A Thanksgiving meal isn't complete unless green beans is on the table! 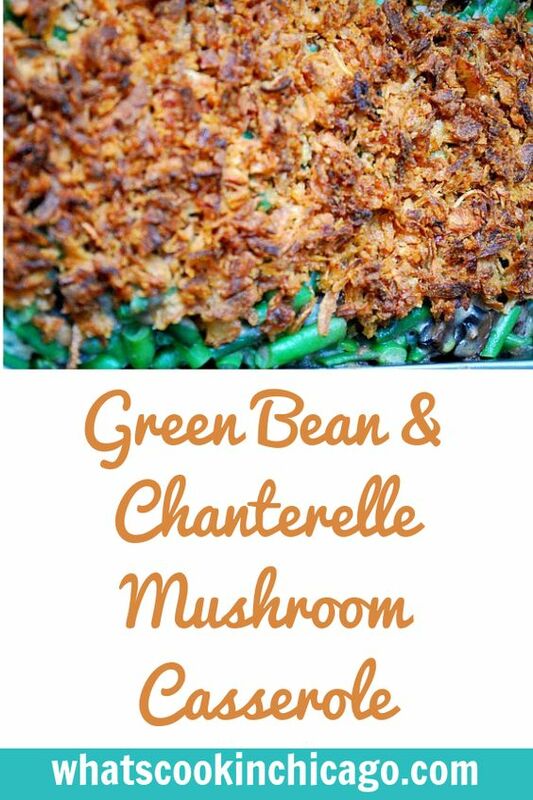 This recipe is a bit different from the traditional green bean casserole because it uses Chanterelle mushrooms and you won't find any canned soup either! Pulse bread, butter and salt in a food processor until mixture resembles coarse crumbs. Set aside. Drop trimmed green beans into boiling, salted water. Cook for 4 minutes. Remove from water and immediately plunge into ice water to stop the cooking action. Drain and let dry. Melt butter in a large skillet over medium-high heat. Sautée chanterelles until soft. Add garlic, thyme, salt and pepper, and cook for 1 minute. Add flour and cook for 1 minute more. Add chicken stock and reduce heat to medium. Stir in heavy cream and gently simmer until mixture coats the back of a spoon. Toss warm mix with green beans and place in an oven-safe baking dish. Top with breading and french fried onions and bake at 375 degrees for 15 minutes or until top is golden brown and bubbling around the edges. Sounds wonderful, I wish I'd had this recipe for our Christmas meal. I'll definitely make it for Easter!